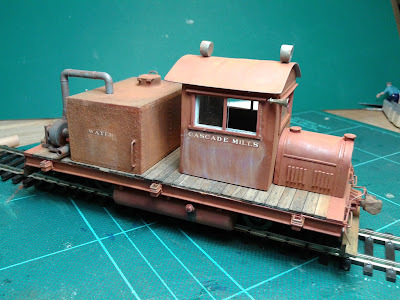 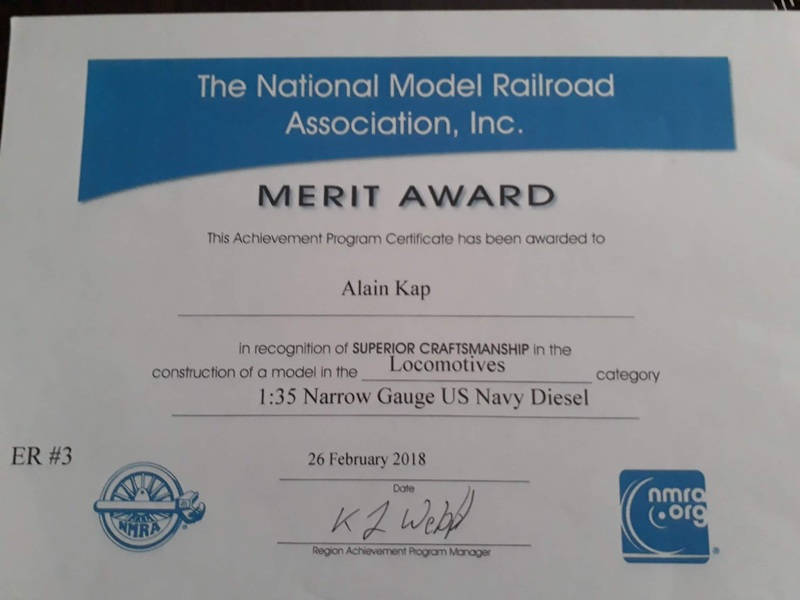 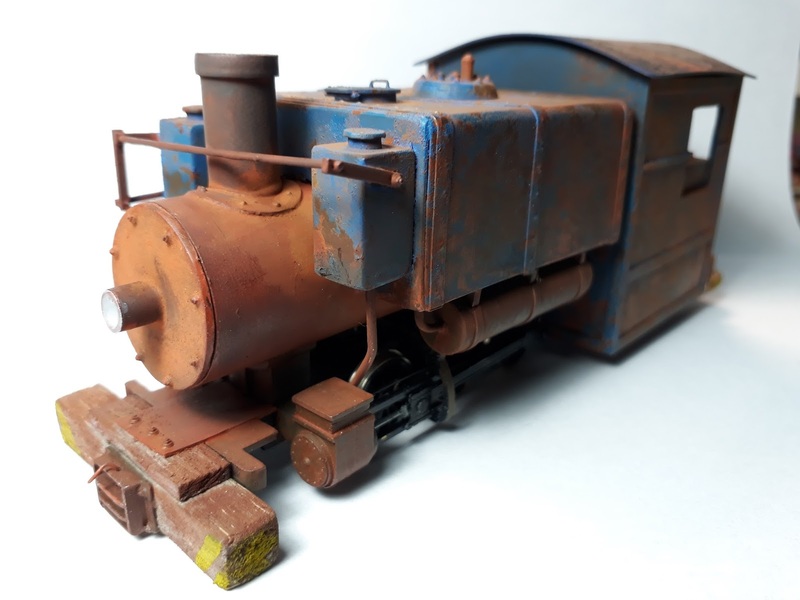 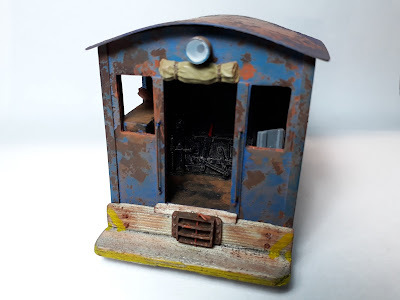 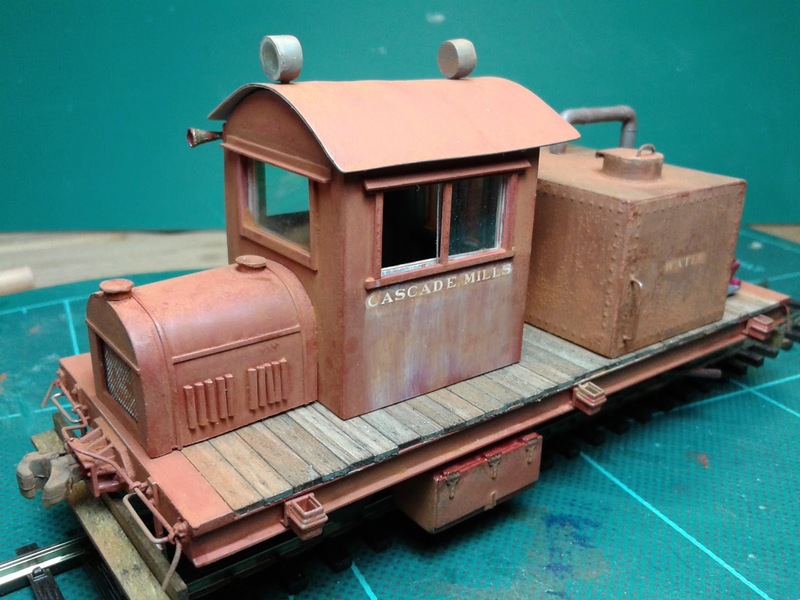 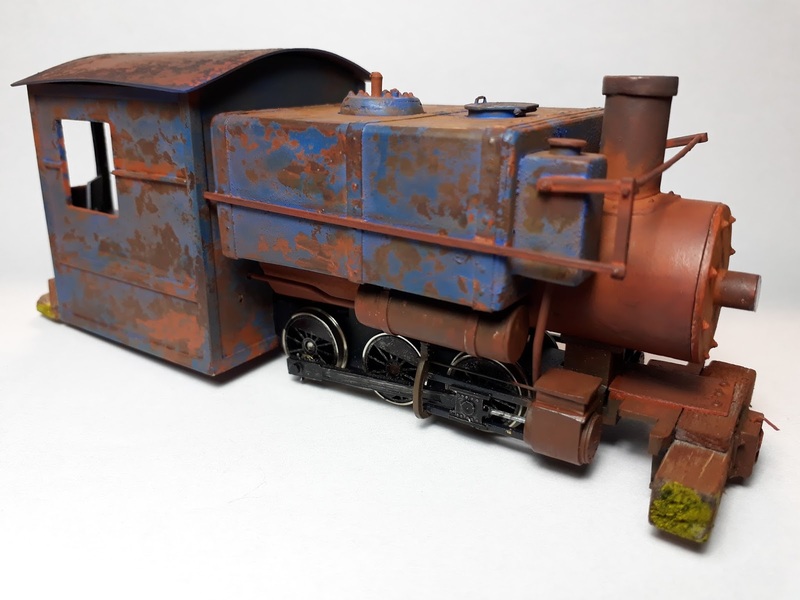 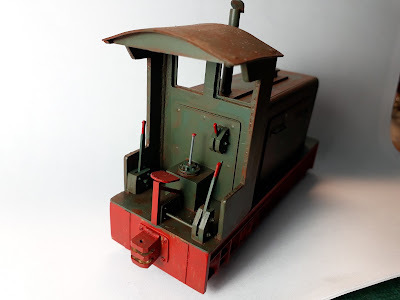 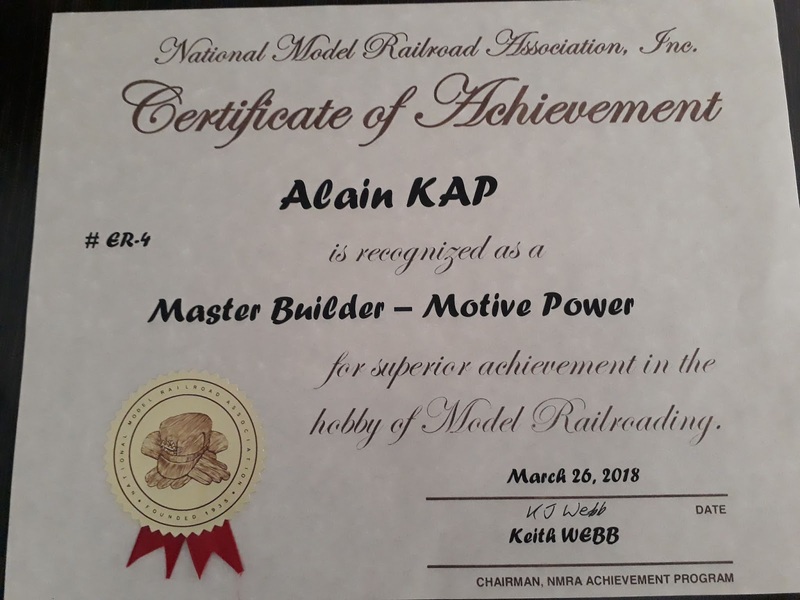 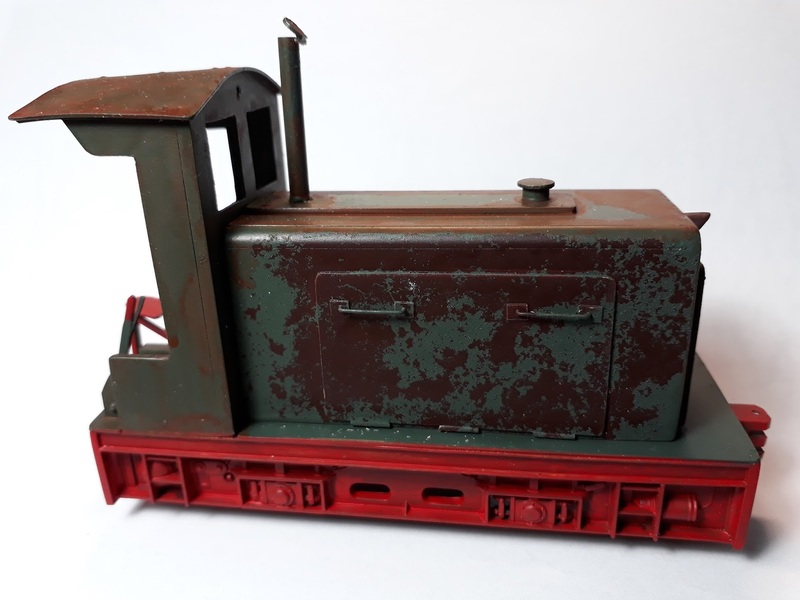 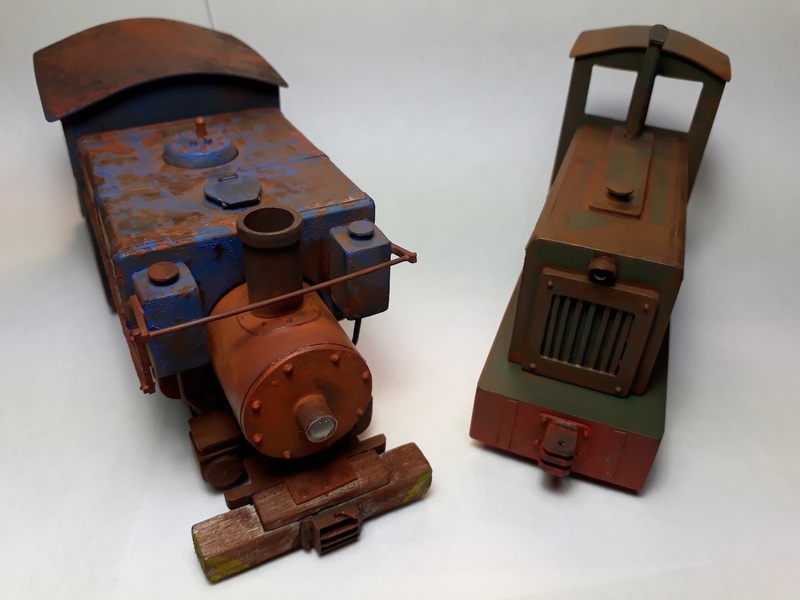 After only two of my three models earned a Merit Award, I build another narrow gauge critter. 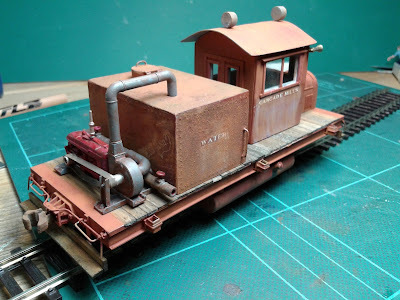 HO powered trucks are very convenient for larger scale locomotives. 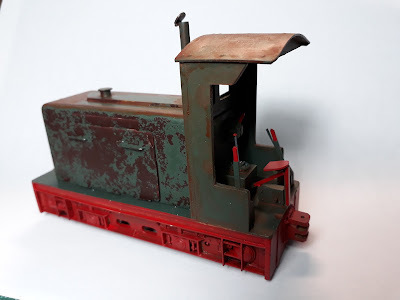 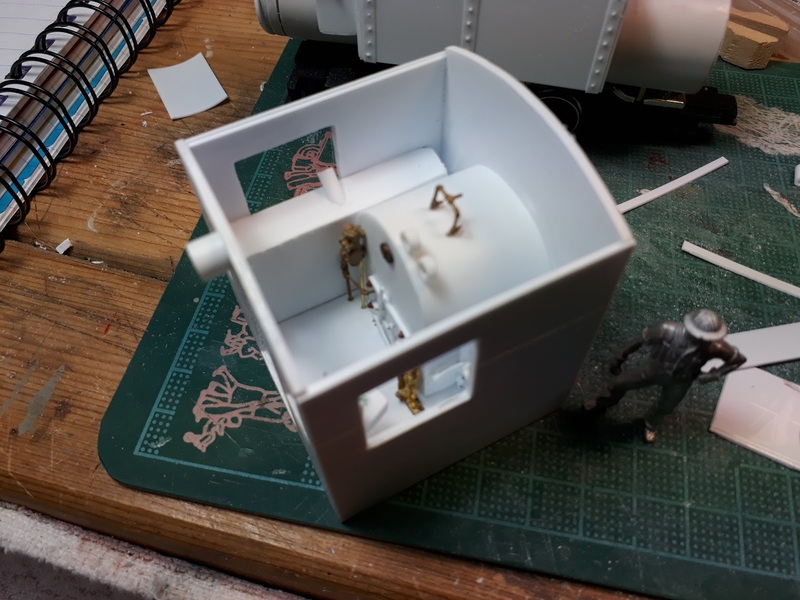 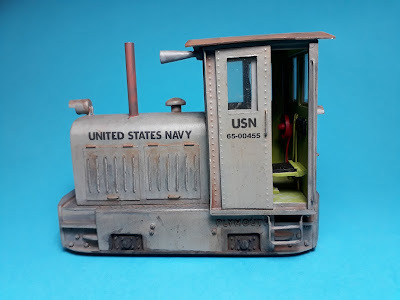 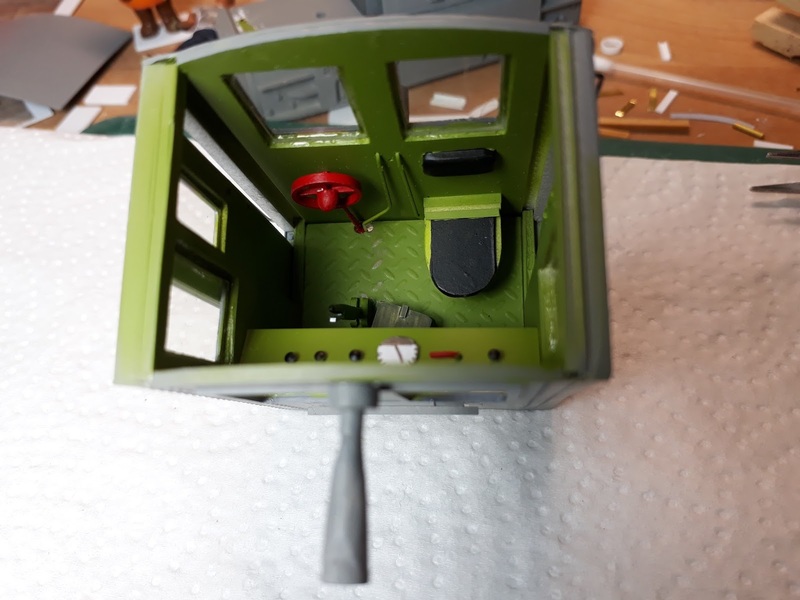 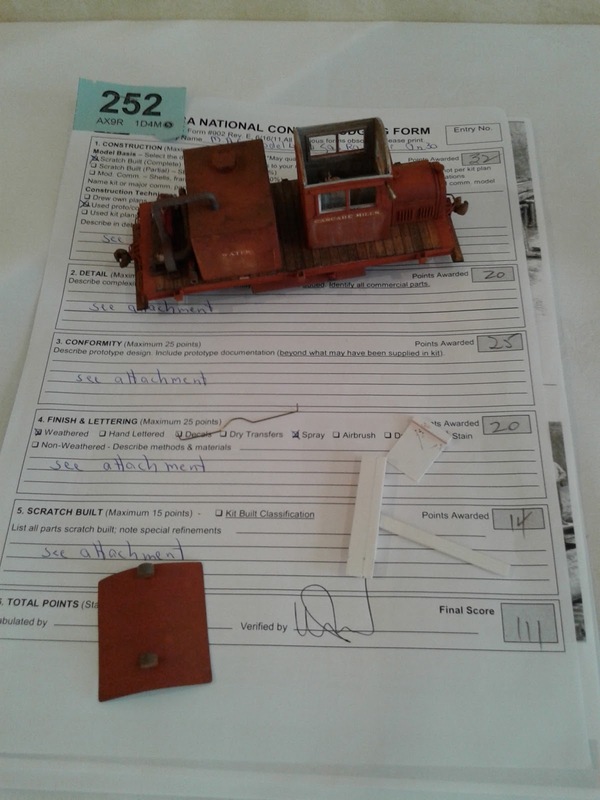 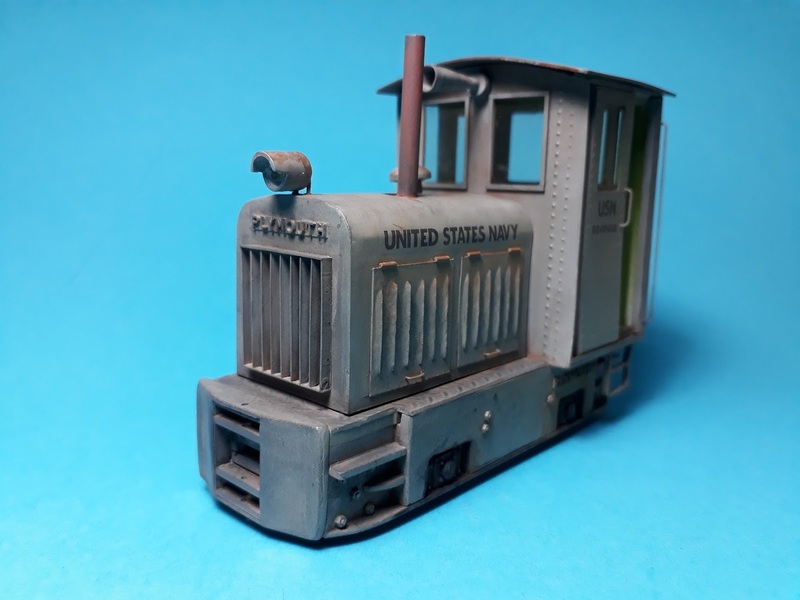 You may use an HO drive to build an On30 locomotive or a 600 mm gauge locomotive in 1/35 scale with HO almost being the scale equivalent of 600 mm. 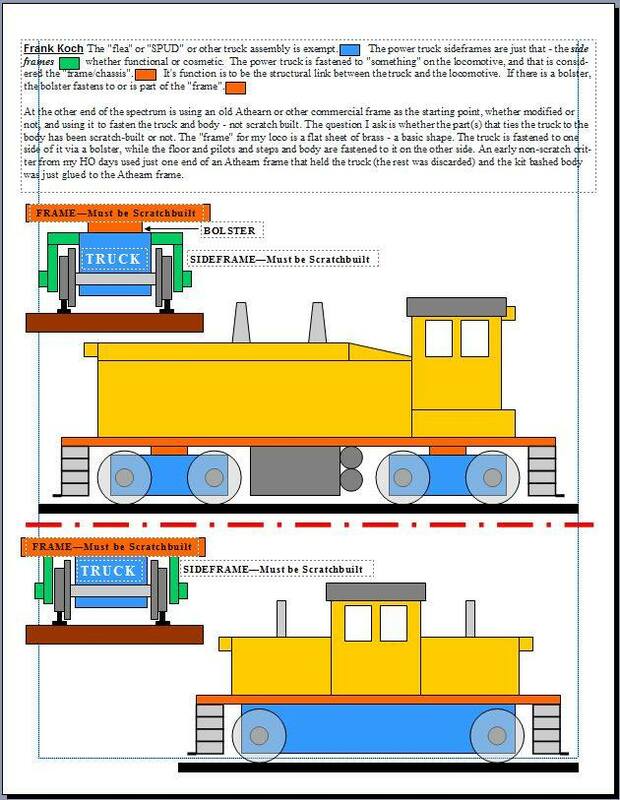 I searched the internet for pictures of suitable narrow gauge diesel locomotives. 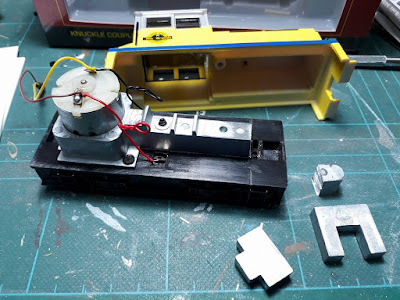 For this littel engine, I again used a powered drive from Model Power. 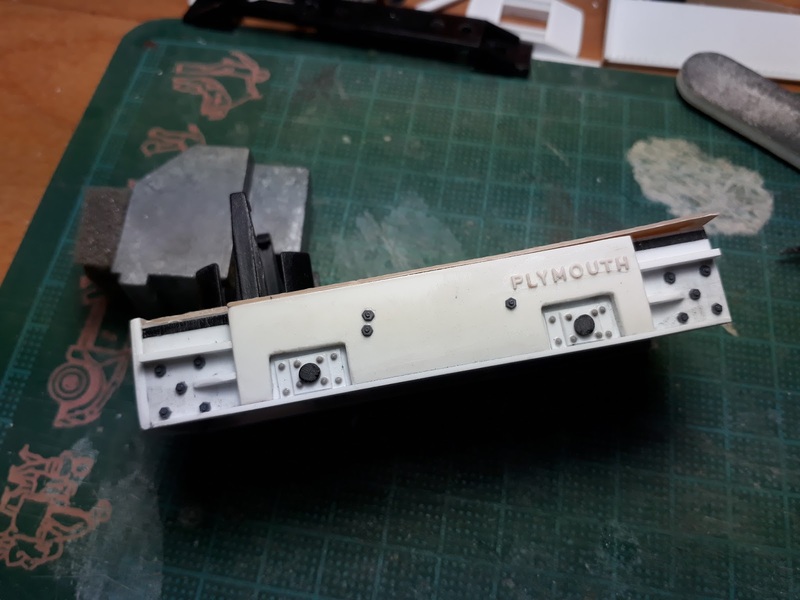 Whereas their Plymouth diesel has the side sills cast to the frame, the Porter drive is clipped into the body of their Hustler locomotive. 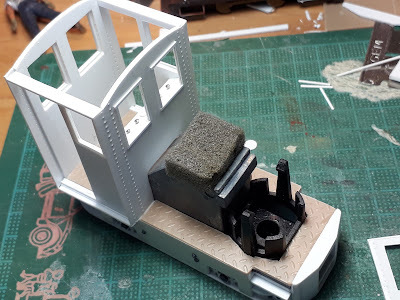 Using the drive as a guide I built the side sills to fit the wheel spacing. I had to make a cut-out in the deck for the the engine mount and a large die-cast weight. 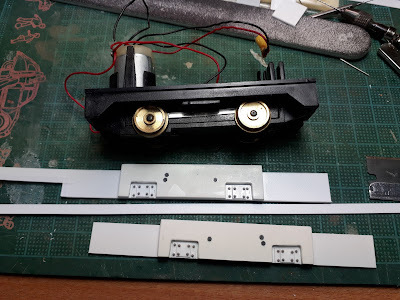 With the side sills and buffer plates, I build a new frame with the drive attached. 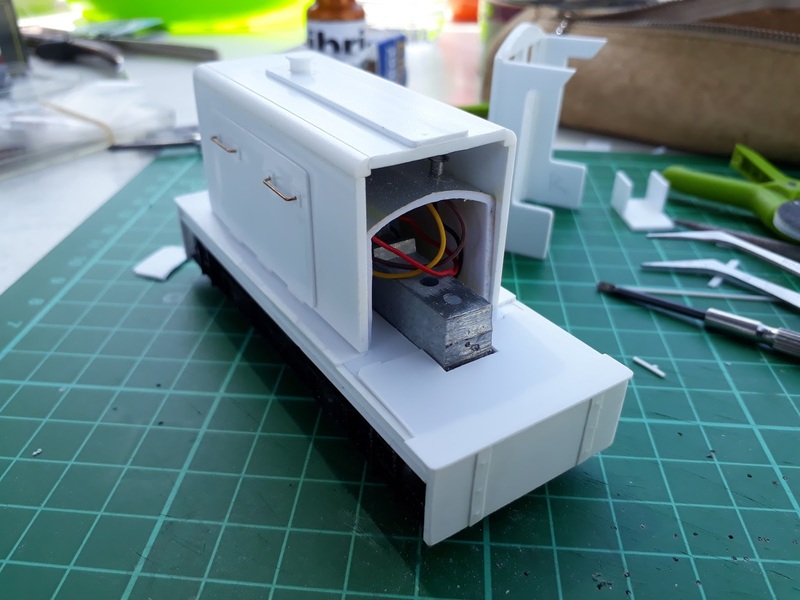 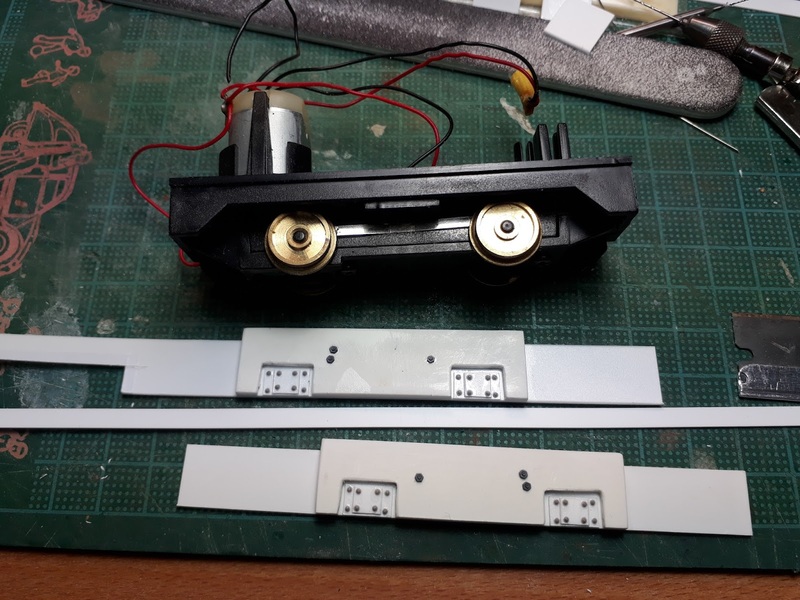 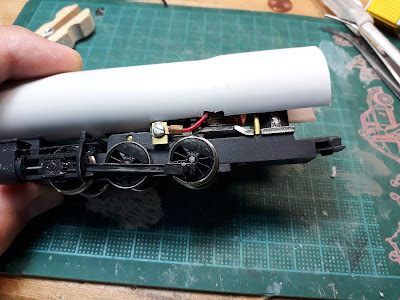 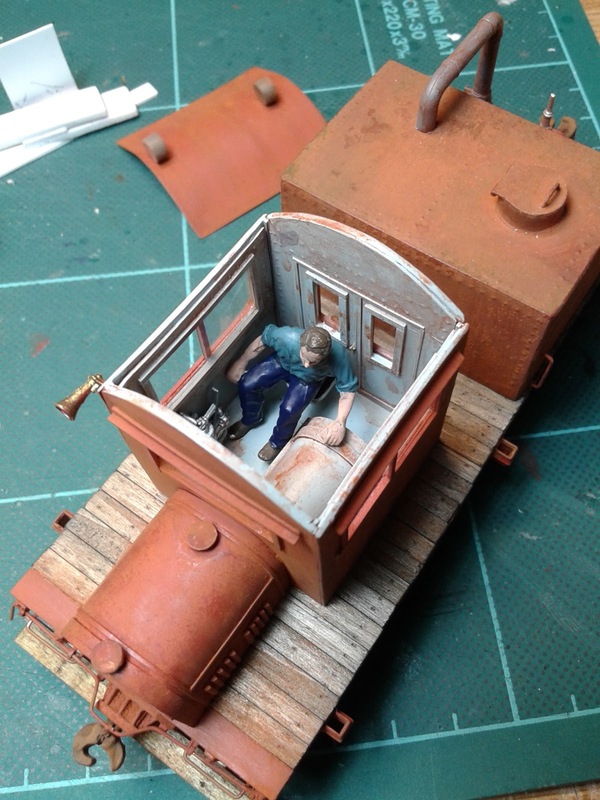 The buffer beams are pieced together with different bits of styrene strip and sheet. 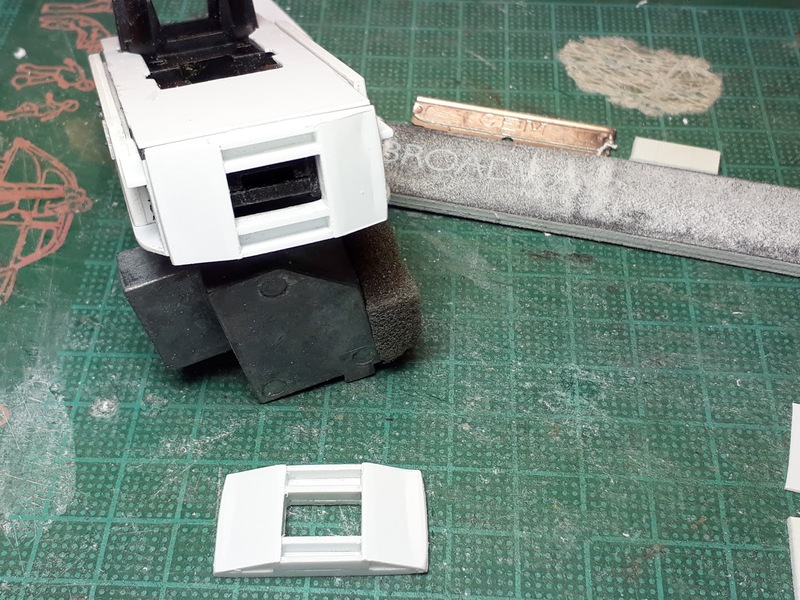 I sanded the to achieve the rounded shape. 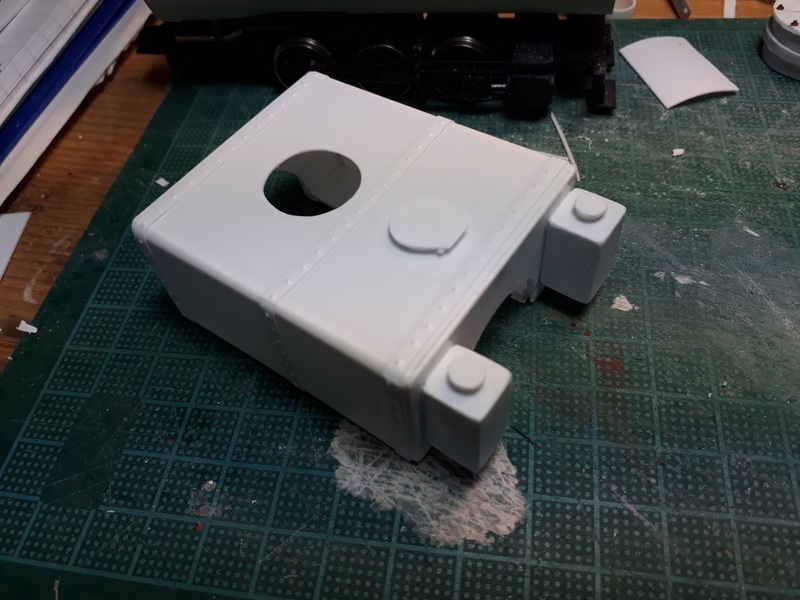 The larger opening is where the Kadee coupler protrudes. 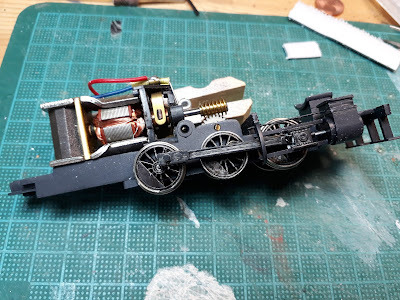 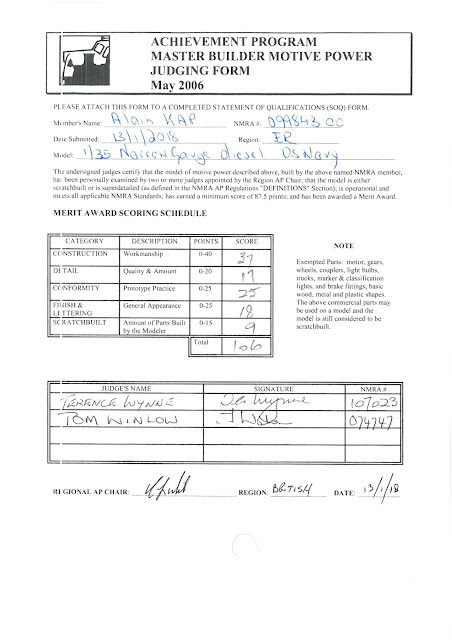 The locomotive may also be used with link and pin draft gear. I added steps, nut-bol-washer castings and Slaters 2 mm letters for the Plymouth signage. The wheel bearers are also layered styrene with n-b-w's. 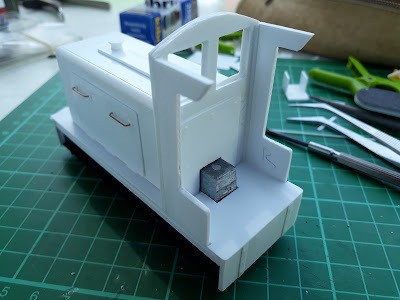 I lined the top of the frame with Slaters styrene tread pattern sheet. 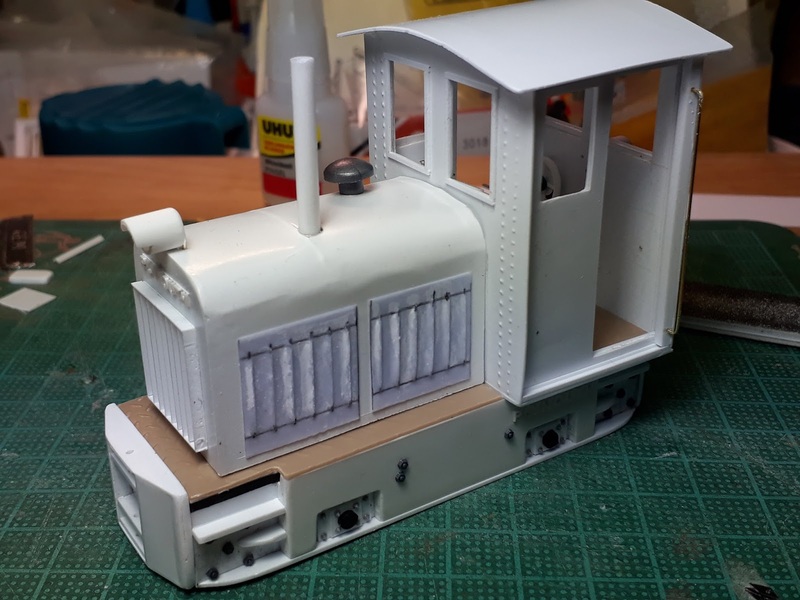 The cab is also built by laminating an inner wall to a base sheet and a thinner sheet with imbossed rivets to the outside. 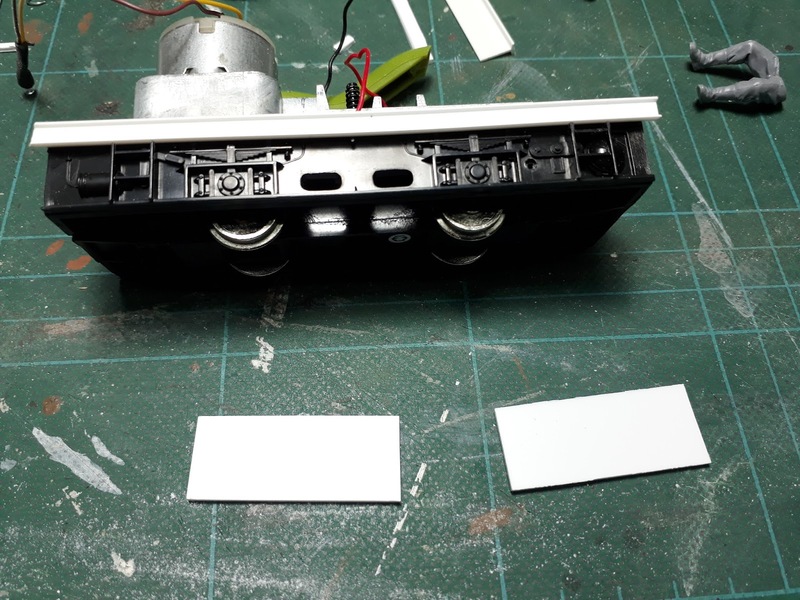 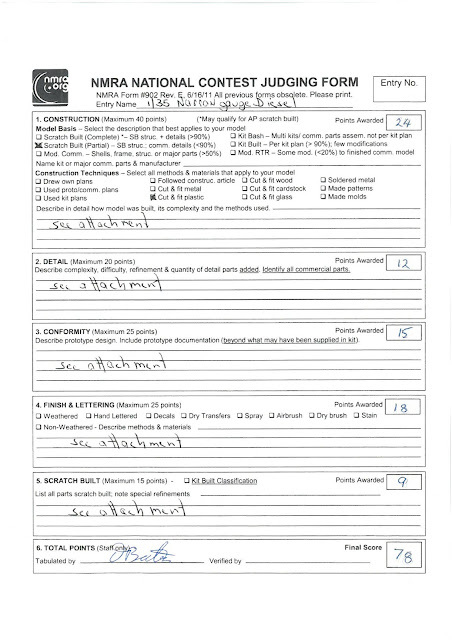 Small styrene strip is used for the window trim and styrene channel for the sliding door guides. 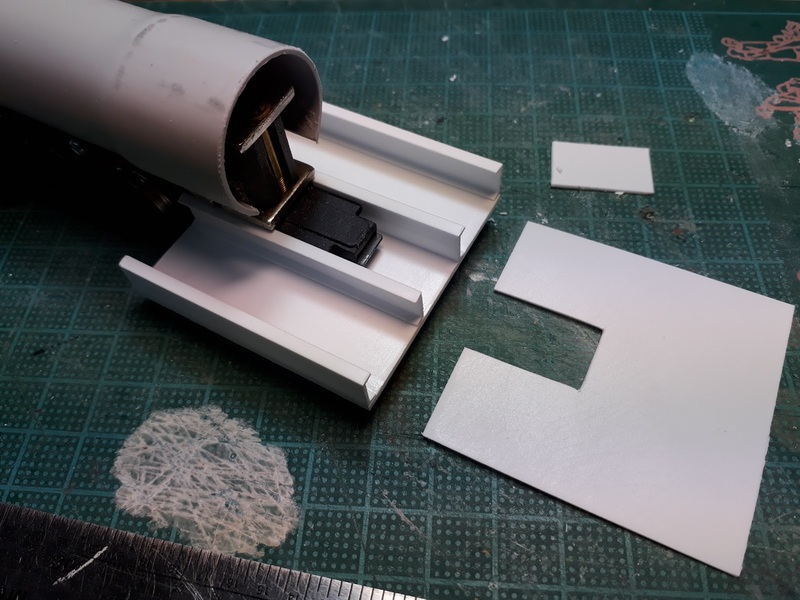 The hood was formed around a styrene core, sanded to shape. 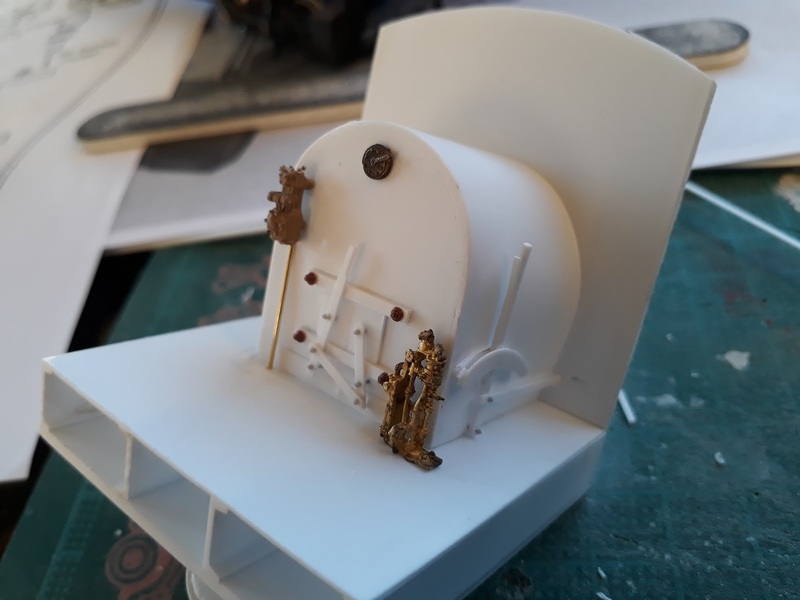 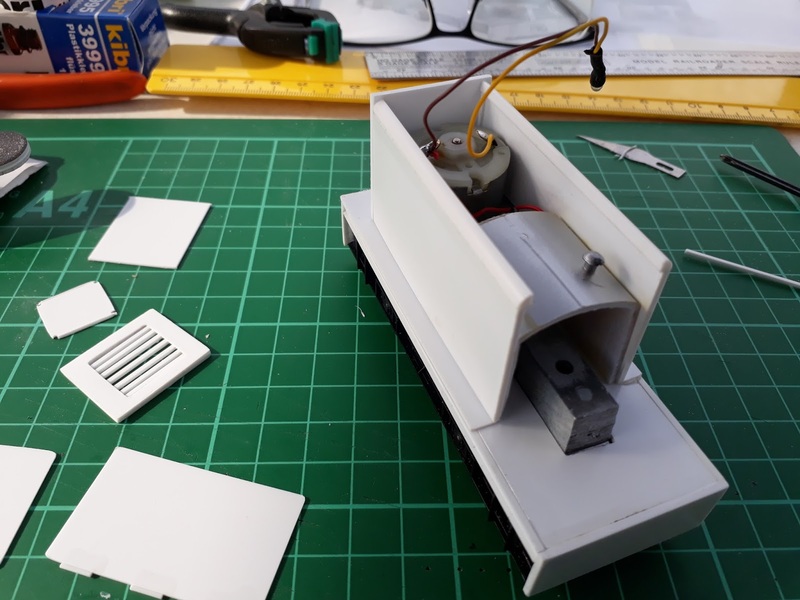 The radiator grill is pieced together using styrene strip and the engine doors are cardboard with louver slots cut and hardened with Super Glue. 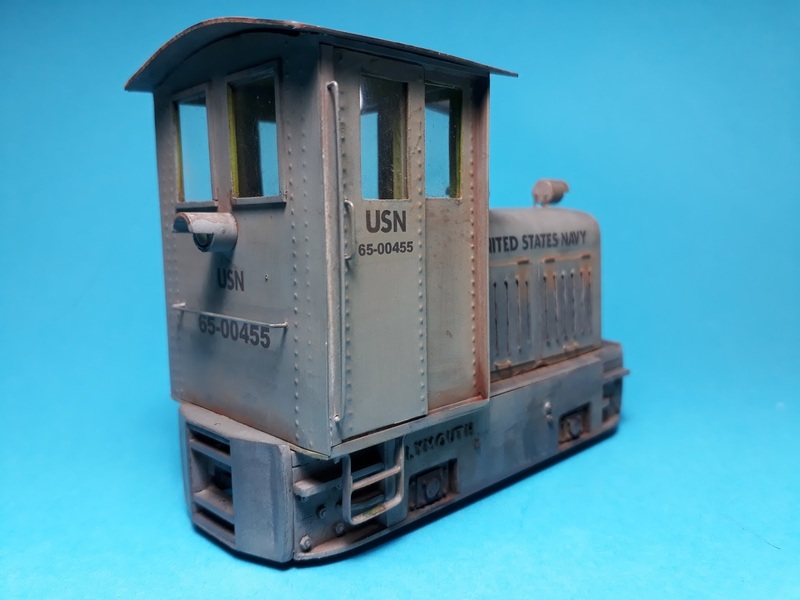 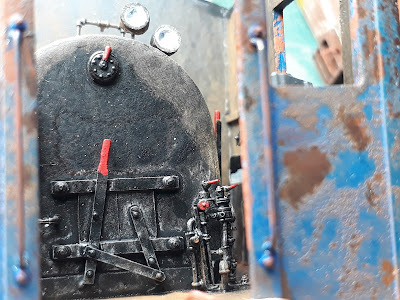 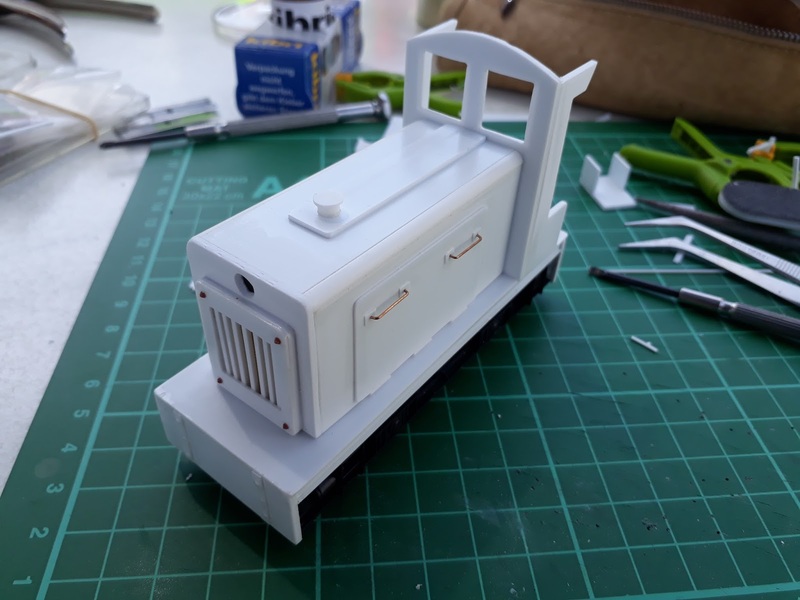 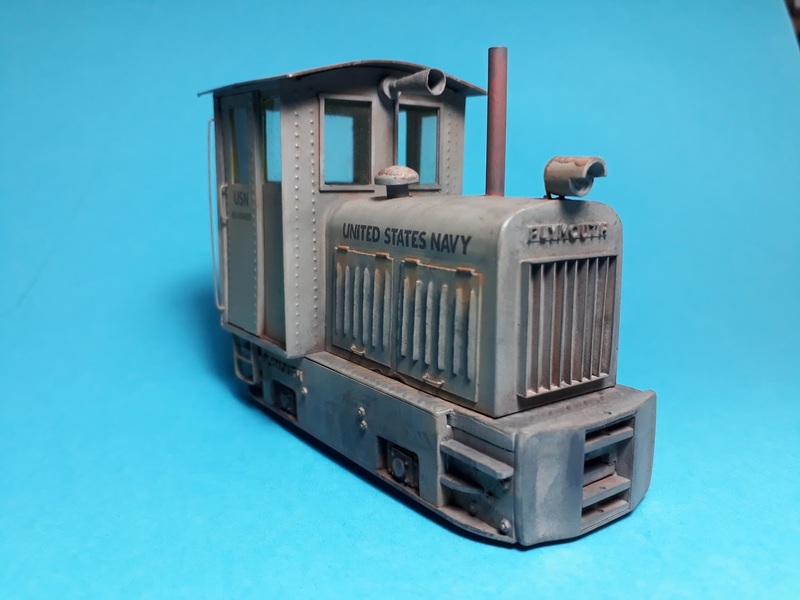 On my previous industrial diesel I used quarter round styrene strips to simulate the louvers, but the openings cut into cardboard are more realistic. The interior features a dashboard with gauges, buttons and ignition key. The buttons are sewing pin heads and the gauge is cut with a paper punch. A folding seat and brake wheel with chain is attached to the rear wall. The lamp shades are cut from styrene tube with LED's added. 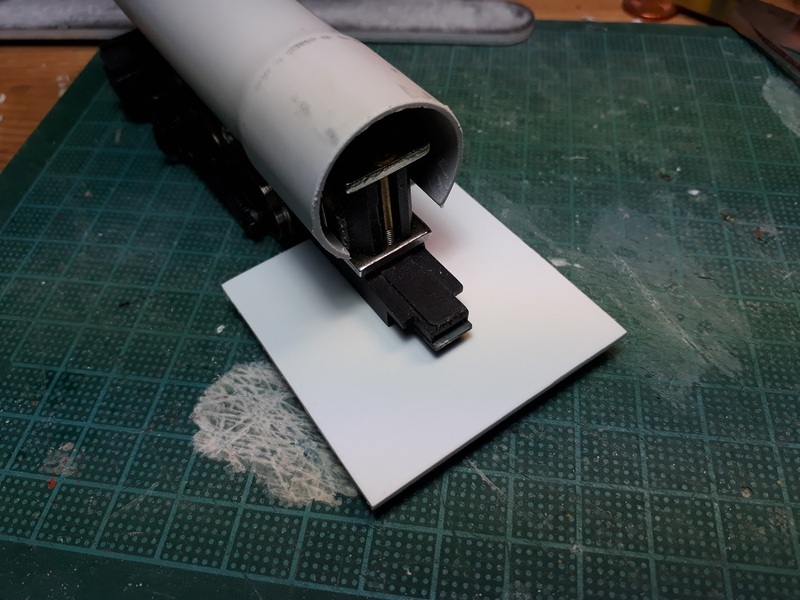 The LED legs serve as mounting pins as well. The horn is scratchbuild using .005" styrene rolled around a core of styrene rod. 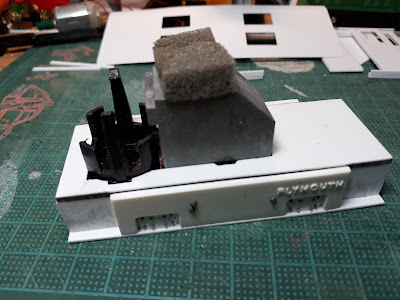 The chimney is also a piece of styrene tube. The air filter intake is an HO roof vent from my scrapbox. 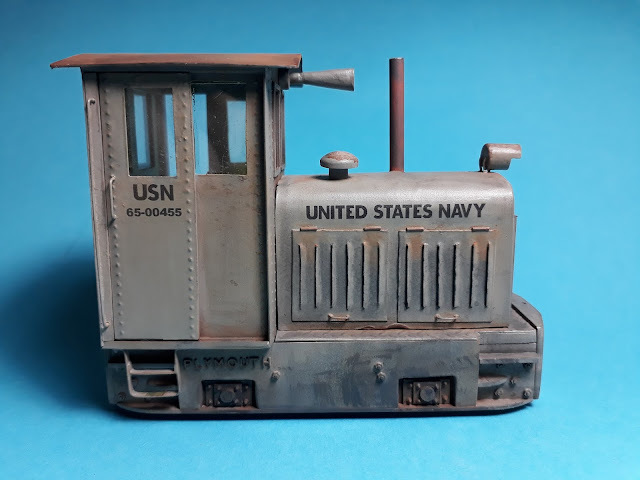 A friend created the USN decals. I painted the locomotive Golden Olive for the interior and Medium Sea Grey on the outside. 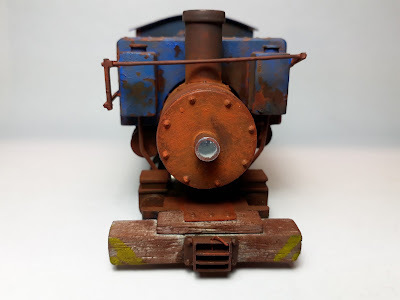 I finally weathered the locomotive with PanPastels. 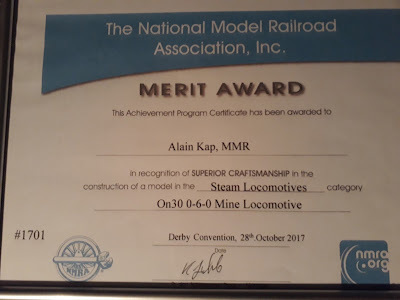 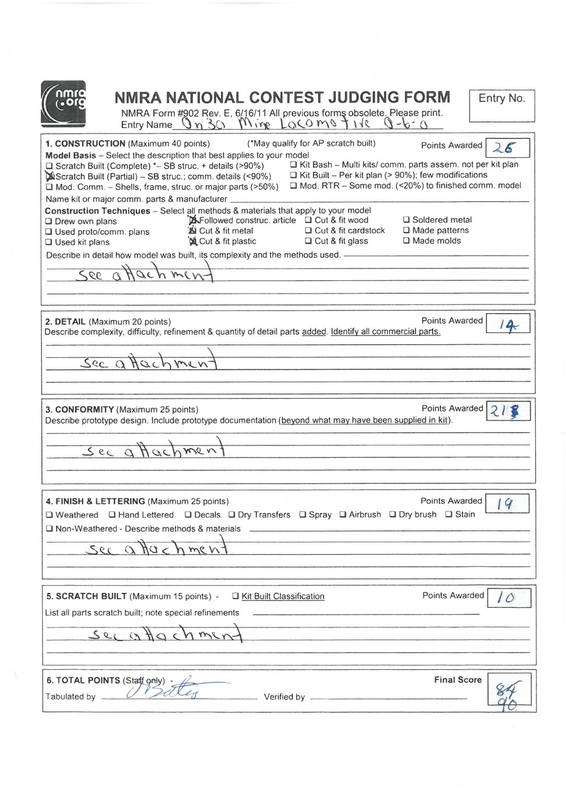 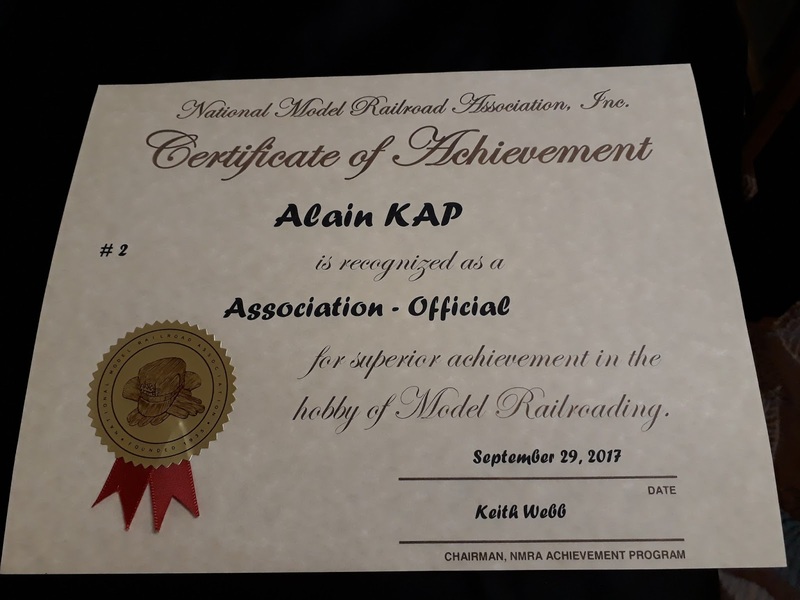 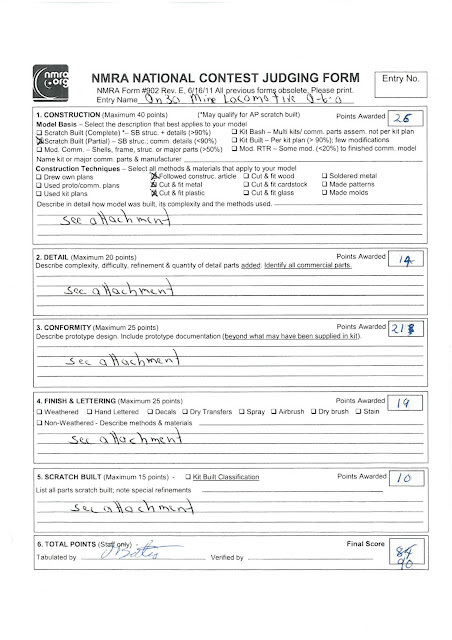 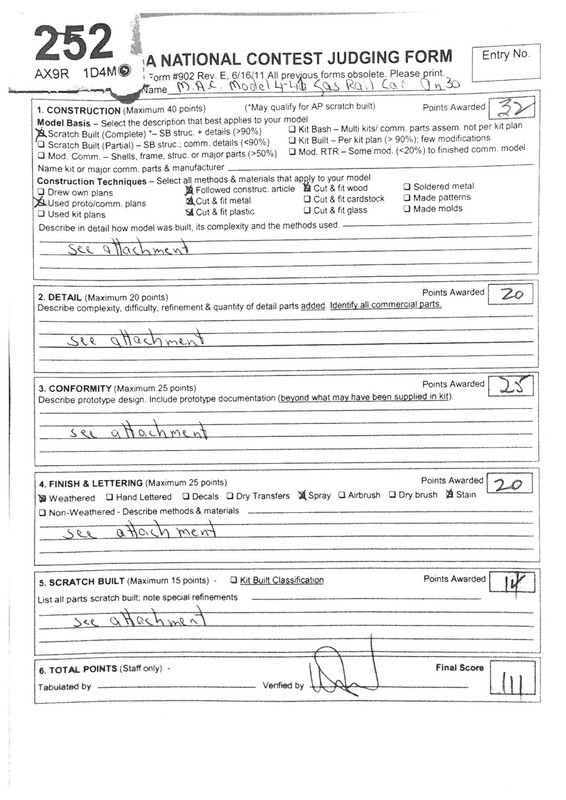 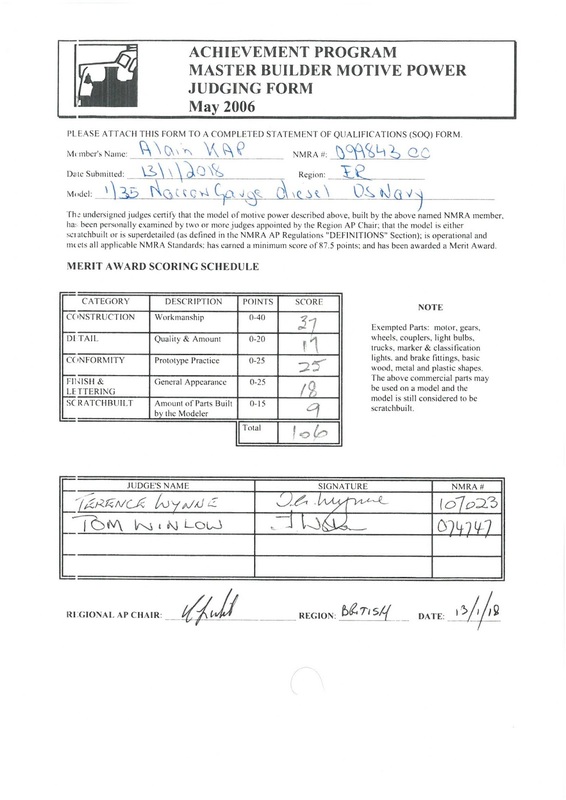 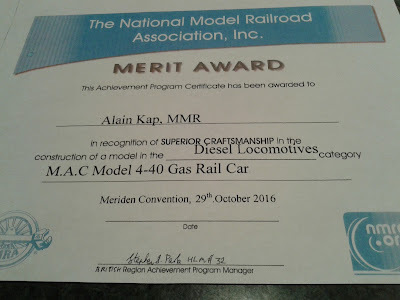 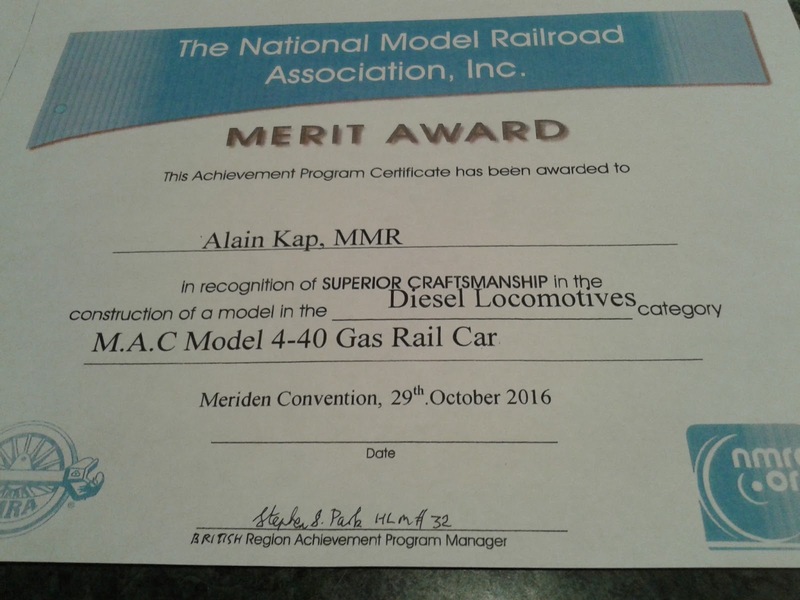 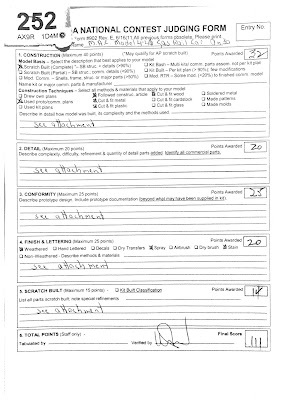 My efforts have been rewarded with a 106/125 score, although the scratchbuilding score is a bit low for the effort put into this locomotive.